Time for afternoon tea! 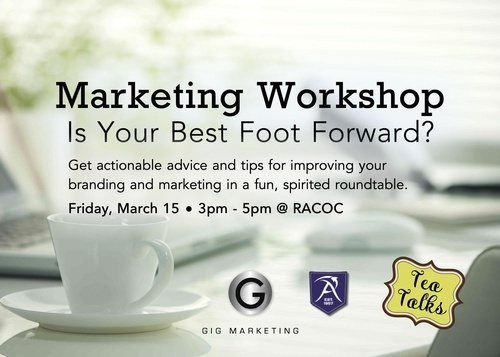 Join Andrea Rhodes @ Gig Marketing for an informative and fun marketing workshop. She'll go over basics and examples of successful branding and marketing, and then turn it over to you! In an informal and comfortable environment, we'll take a look at what you're doing - your website or promotional materials - and do a quick marketing makeover. You should come away with new ideas and approaches to put your best foot forward.